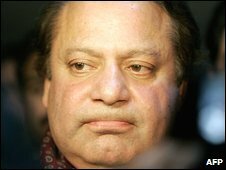 Pakistan opposition leader Nawaz Sharif has been placed under house arrest in the city of Lahore, his party has said. The interior ministry told the BBC there were no curbs on Mr Sharif's movements - police were protecting him. Ex-prime minister Mr Sharif had planned to lead a rally in Lahore ahead of a march on the capital, Islamabad. Police fired tear gas at protesters in Lahore. Mr Sharif told those gathered outside his home the entire country had been turned into a "police state". "They have blocked all roads, they have used all sorts of unlawful tactics," Mr Sharif told reporters on the front step of his home, Reuters news agency reported. Mr Sharif has thrown his weight behind a nationwide "long march" by lawyers demanding the reinstatement of judges removed by the former government. The demonstrators are planning to converge on the capital on Monday for a sit-in outside parliament. But the government has set up roadblocks to seal off Islamabad and banned rallies, saying they could trigger violence. The BBC's Barbara Plett in Islamabad says the campaign over the judges has become a power struggle between Mr Sharif and current President Asif Ali Zardari. President Zardari - the widower of former prime minister Benazir Bhutto - promised to bring back the judges when he took office last year following his wife's assassination. Riot police surrounded Mr Sharif's home on Saturday night before blocking all access roads and reportedly baton-charging his supporters when they came to protest. Pervez Rasheed, a spokesman for the detained politician's Pakistan Muslim League (PML-N), said a senior police officer had said Mr Sharif would be detained for three days. Mr Sharif's brother, Shahbaz, also a senior politician, is said to be in hiding in the garrison city of Rawalpindi near Islamabad at a property also surrounded by police. PML-N says a number of opposition leaders have also been placed under house arrest. PML-N spokesman Ahsan Iqbal told the BBC President Zardari was using "undemocratic measures... to crack down on a very peaceful movement". But interior ministry chief Rehman Malik told the BBC Mr Sharif was free to go anywhere and the police outside his house were for his own protection. "I categorically confirm no restraining orders, no arrest warrant, no house arrest. He's totally free to move anywhere in the country," Mr Malik said. He added: "We are under heavy threat of the terrorists... and that has been conveyed to Mr Nawaz Sahirf, Shahbaz Sharif and other political leaders." Gen Musharraf led a military coup in 1999 that ousted then-Prime Minister Sharif, and ruled until 2008. The tensions between Mr Zardari and Mr Sharif date back to the 1990s, but the two formed a brief partnership in government after parliamentary elections in February 2008. Mr Sharif's PML-N left from the alliance in August 2008, complaining about the PPP's reluctance to reinstate former Chief Justice Iftikhar Chaudhry and other judges sacked by President Musharraf. Relations have been further strained in recent weeks by a Supreme Court decision to ban Mr Sharif and his brother Shahbaz from elected office, and President Zardari's decision to put their stronghold in Punjab province under direct rule from Islamabad. Shahbaz Sharif was Punjab's chief minister. But on Saturday, in a move seen as a conciliatory gesture, the government agreed to seek a review of the Supreme Court ruling. The political instability comes as Pakistan faces an economic crisis and a growing militant insurgency based in the north-west.